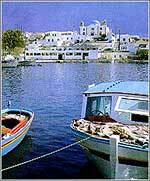 Not far from Patmos is a group of tiny islands, known collectively as Lipsi. They cluster round the largest, the only one which is inhabited, Lipso. Here you will find beautiful sandy beaches and translucent waters. The island is so small that you can go everywhere you want to on foot. The hamlet on the protected natural harbour is composed of spotless whitewashed houses, while its mini-piazza boasts tavernas, ouzeri, cafes and other eateries serving fresh fish and local wine. Some magnificent beaches are at Lientou, Kyr-Vasilena Platys Gialos, and others. Lipso - another name for the island - for 566 years, from the period of the Byzantine emperor Alexios Komnenos I, was completely owned by the Monastery of Patmos, which even today retains property rights here. The Nikiforeion Ecclesiastical Folk Museum of Lipsi houses antechristian exhibits.